“Mongolia is the most incredible visual poem. The skies, the colours, the swift change of weather, the mist circling around our yurts in the morning, the open space, the feeling of going back to what life’s about, the people. I can go on and on. If you’re looking for the retreat of all yoga retreats this is it: strong and sweet yoga classes with one of the absolute best Jivamukti teachers on earth, works of art on your plate to eat, heavenly massages and spending time with a global satsang of radiating fellow travellers. 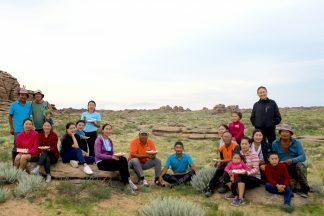 Our yoga retreats in Mongolia are powerful and heart warming experiences for us all. 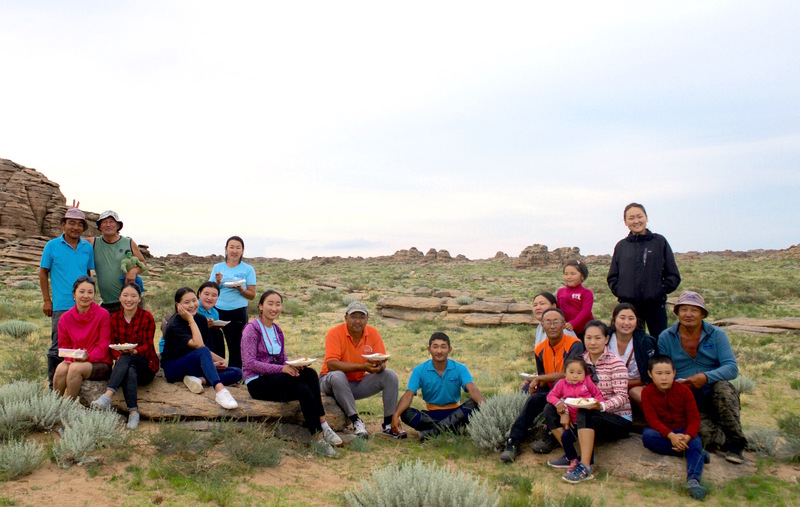 We have been running yoga and meditation retreats in Mongolia for three years now and we can’t wait to go back again. We are back there 22-31 July 2019. Mongolia is definitely one of those “trip of a lifetime” retreats that inspires and challenges you in equal measure. 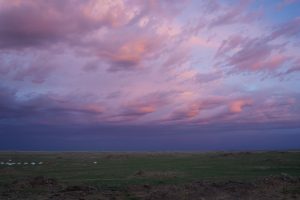 Landscapes: Mongolia is a remote place and much of it is uninhabited. Spending time in its vast, empty landscapes can have be profound. The Gobi desert is “a place like no other” with its ancient rock formations and sandy moonscape terrain. In complete contrast the Khan Kentii region is a lush, green paradise where herds of wild horses graze in lush meadows. Mongolian skies are worthy of their own blog post! Culture: Nearly half of the population are nomadic pastoralists, living in yurts (they call them gers) and tending to their herds of horses, cows, goats and camels on horseback or motorbike. There is something very thought-provoking about encountering this kind of lifestyle, especially if you live a busy city life. Horses: Riding in Mongolia is so much more than just the ride, exploring on horseback in the company of a local herder is a truly exhilarating way to enjoy the Khan Kentii wilderness. Experienced riders are in their element here – mastering the Mongolian riding style on semi wild horses, splashing across rivers, up mountains and through forests. (If you are really keen to ride and are not experienced, please take some lessons before you come). Yoga and meditation: Practising Jivamukti yoga with the inimitable Emma Henry is at the core of our yoga retreat experience. It is strong style of yoga that includes chanting, flowing vinyasa sequences, alignment exploration as well relaxation and meditation. The twice daily yoga practice on our retreats provides the foundation of this trip. The yoga teachings guide you through the highs and the lows, inspire you to connect completely to yourself and your environment, encourage you to confront your discomfort, support you and put you back together after a long day. 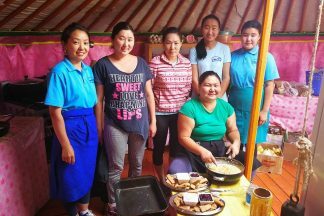 Food: The very excellent Bettina Campolucci Bordi and her Mongolia crew create the most delicious plant based food on this yoga retreat. It’s filling and sustaining and very tasty! 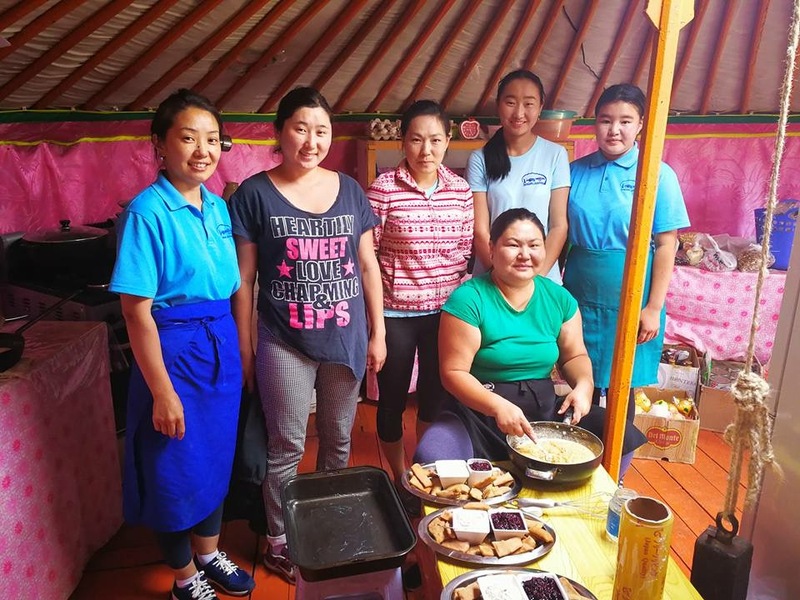 Mongolian’s are generally not vegans but the kitchen crew have mastered the art of creating yogi menus and it is quite amazing to see them at work in their yurt kitchen. With limited ingredients and a solar powered fridge, it is not without its challenges but our guests say the food is another highlight of this yoga retreat. This year Bettina was out at 5am with her team foraging for wild onions and herbs. It seems that Scandinavians and Mongolians are a match made in heaven when it comes to getting out in nature at all times of the day (and night) to look at flora and fauna! 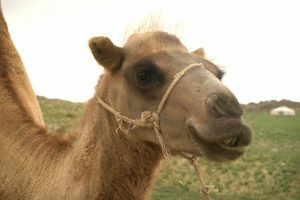 Camels: Camels are just very cool aren’t they? We have our own herd in our Gobi retreat camp. We met this dude when he was a baby last year, now he is a teenager! The camels are often at work (fetching water, pulling carts etc) but in-between you can head out for a ride to explore the strange and wonderful landscape around the camp. No ensuite bathrooms: Our yurts are beautiful and we have chosen luxury yurt camps for you, but there are no ensuite bathrooms. 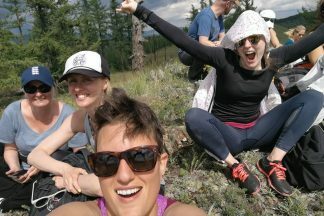 This is true glamping and a very “outdoorsie” yoga retreat. The toilet is a short walk away from camp. Water has to be collected by camel or yak and heated on a fire, so your hot showers need to be pre-booked. 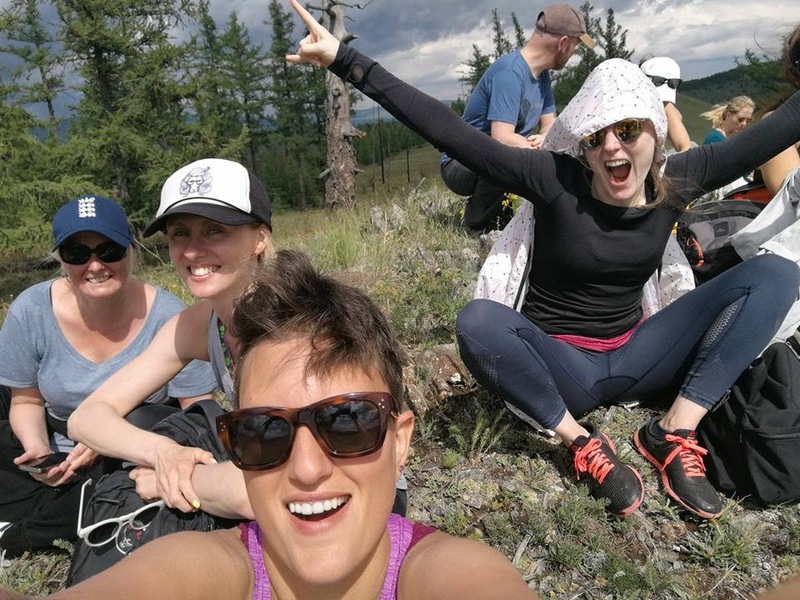 Embrace the journeys: It takes time to get to Mongolia and if you have come from Europe it is a big shift in time zones, meaning you’ll probably feel pretty tired and have jet lag for the first day or so of your retreat. Mongolia is a big country and epic journeys are very much part of this trip. It takes all day to get to each camp (by train and jeep) and some of it is off-road and it’s bumpy! The yoga and massages help and we have a sauna yurt at our second camp that really does make you feel amazing. 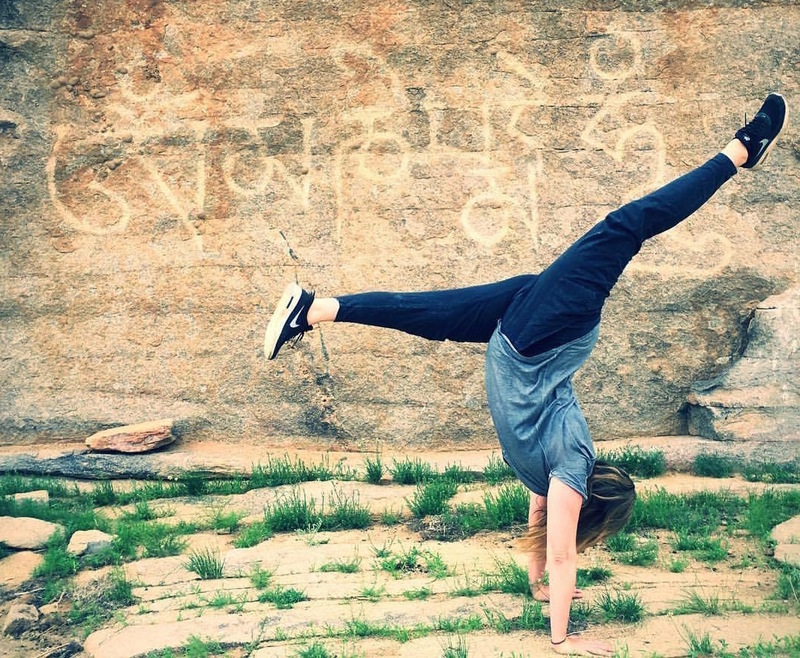 It is physically demanding: This yoga retreat involves a lot more physical activity than your average yoga retreat: Lots of travelling, early starts, strong yoga (and plenty of it), horse riding, camel riding, trekking and climbing mountains. For you yoga gym bunnies this is right up your street. It’s definitely not a “lie over a bolster and sigh” retreat! Is this the retreat for you? Do you think you will fall in love with Mongolia (like us)? Thank you to Bettina Campolucci Bordi and Emma Henry for sharing your images. Next post: The best yoga retreat breakfast ever?